ELVIS made it a hit. It’s been covered by the Blues Brothers and many others. 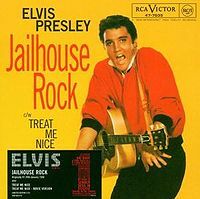 But Jerry Leiber & Mike Stoller’s “Jailhouse Rock” is a very strange song indeed. It is all about homosexuality in prisons. There can be no question of that. You see, it is set in a male prison. That’s right — a “Jailhouse”. There is only one gender — male. Jails tend to be set up like that, men with men, women with women. Soon “The joint was jumping and the place began to swing” — “swing”? really? “Everybody on the whole cell block was dancing to the jailhouse rock”. We can only conclude that Sad Sack took the warden’s advice and either found a “partner” (another man), or else used a chair! This is the only time I have ever heard reference of cuteness between men, let alone felons! The fact that “Shifty Henry” and the chance to break-out and escape was foregone in favour of “Sticking around to get my kicks” is conclusive, don’t you think? The Purple Gang actually refers to a defunct Detroit group of mobsters that were quite violent. They were known for hijacking and pretty much running Detroit throughout the 1920s. Hee hee, what about the line, “Little Joe was blowin’ on the slide trombone!” A bit slashy there, if you ask me. I’m not sure whether or not Elvis had any idea, but I have a hunch that Lieber and Stroller knew what they were doing. Why are queers these days referred as gay? there are many songs still played on radio with gay in the lyrics but not meaning queer! i.e. : Only yesterday I was cheerful bright and gay. I cannot listen to this song without thinking about all this gay stuff. I’m gay with a dirty mind anyway, but this is all so obvious!